As many of you who read my witterings will know, I'm a big fan of the Escape Music label. They seem to be able to find many new artists that few of us have heard of before and put out their good albums, for all of us to enjoy. Scar For Life are another such act (for me anyway) that Escape have found but this new release is actually their fourth studio album to date. Built around the guitar and song-writing abilities of Alexandre Santos, the band's first few albums featured guests like the future Anathema drummer Daniel Cardoso, Ged Rylands and Neil Murray. This trend for using guest musicians continues on 'Worlds Entwined' with Vinnie Appice, Mikael Carlsson and Neil Fraser (Ten) joining the band on various tracks. Though SFL don't actually need to use them because the band of Santos, Teen Asty (bass), Joao Colaco (drums) and new vocalist Rob Mancini (Hotwire/Crush) are all superb at what they do. The music itself though is a little harder to describe because we get is a smattering of Classic Rock, touched with bits of Modern Pop Rock, that are then splashed with dashes of Hard/Melodic Rock. They are one of those bands who remind you of a lot of other acts, whilst still retaining their own very strong identity. Opener 'Thirteen Revolution' is a bit of a strange one; its heavy guitar riffs and slow pounding drums at first remind you of Black Sabbath, when the chorus kicks in however a different band appear, with a groove and swagger that reminds you of many American Hard Rock groups. 'Because I Can' follows and it has a more aggressive and modern guitar sound and the way Mancini sings it, with a sneer on his lips, gives the song a whole chip on the shoulder attitude and once again the band excel in the chorus. Two more highlight tracks are the highly melodic 'Vendetta' and 'The Patriot', both drip with harmonies that are contagious and the guitars, vocals, bass and drums join together in a Hard Rock miasma that is infused with big hooks and tight powerful musicianship. 'My Dark Serenade' is the big ballad and Mancini really shows his chops, holding your attention from first to last as he sings. Finally I'd like to mention the dark and brooding Harem Scarem-like 'Carols Wonder'. It's awash with a dramatic melancholia that seeps in to its very pores and the whole band are on fire as they attack this song. 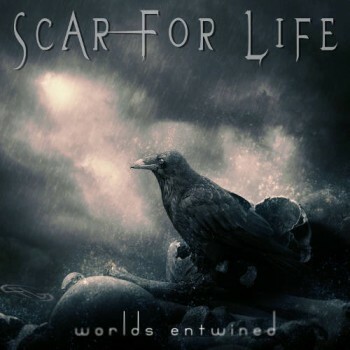 Scar For Life have made a very entertaining album and I must go and track down their earlier efforts because I have, it would seem, missed out on another really great band.